The stated mission of the United Nations Peacekeeping forces is an admirable one, but in the wake of 2015’s evolving global threats, the principles of the Peacekeeping forces have markedly constrained the mission from becoming one that can achieve the primary goal of the United Nations as enumerated in Article 1(1) of the UN Charter: “to maintain international peace and security, and to that end: to take effective collective measures and removal of threats to the peace”. Perhaps the most crushing of these tenants is the hesitance of the United Nations to increase its intelligence collection capabilities in aid of the peacekeeping process, despite calls (such as those seen in the Brahimi report) for the organization to take on a stronger role in the arena. Due to the nature of the covert scheming of international terrorist threats coming from universal antagonists such as the Islamic State of Iraq and Syria (ISIS) that have the ability to carry out covert attacks without a defined military force on civilians and military actors, it is of vital importance that the United Nations expands its intelligence collection policies to match its expanding use of offensive peacekeeping if it continues to send UN Peacekeepers into these situations. Protection of civilians is one of the core obligations of the United Nations, and the organization will fail if it continues to be haphazard in its approach to intelligence gathering. Moreover, a continued refusal to adequately train, equip, and allow Peacekeeping forces to engage in counterinsurgent intelligence collection activities clearly shows that Peacekeepers should not be sent into these offensive peacekeeping arenas. Otherwise, sending the Peacekeepers into these situations would be the penultimate definition of negligence and expose them as sitting ducks against insurgents and other non-state actors. Although peacekeeping is not explicitly mentioned in the UN Charter, its use has been legally grounded in Chapters VI and VII. Chapter VI, the “Pacific Settlement of Disputes”, permits the Security Council to “investigate any dispute, or any situation which might lead to international friction or give rise to a dispute, in order to determine whether the continuance of the dispute or situation is likely to endanger the maintenance of international peace and security”. This works in tandem with Chapter VII, “Action with Respect to Threats to Peace, Breaches of the Peace and Acts of Aggression”, which allows the Security Council to counter threats to the peace by “air, sea, or land forces as may be necessary to maintain or restore international peace and security”. Traditionally, peacekeeping operations have been rooted in three principles:  consent of the parties,  impartiality of the peacekeepers, and  the non-use of force except in cases of self-defense. At face value, the principles say this: the United Nations is not allowed to send in the Peacekeepers without consent of both of the parties to the conflict, the Peacekeepers are not allowed to enter the hot-zone with any prejudice or preference in favor of one of the parties over the other, and the Peacekeepers are not allowed to use force unless they are acting in self-defense. Fortunately for global security and the safety of the Peacekeepers themselves, recent practice has not aligned with these three historical tenants. The Capstone Doctrine has argued that “In the absence of . . . consent, a United Nations peacekeeping operation risks becoming a party to the conflict; and being drawn towards enforcement action, and away from its intrinsic role of keeping the peace.” This tenant is advanced in an attempt to make the goals of the Peacekeepers more attainable in both a practical and normative sense. However, the tenant becomes non-sensical in relation to conflicts between states and non-state actors such as ISIS in which it is virtually impossible to obtain their consent, especially given the lack of any formal peace agreements that would come about in conflicts of this nature. Moreover, non-state insurgents are even less likely to engage in any type of peace agreement because they flourish in the face of random acts of regional violence that make the local population more likely to align with the insurgent forces. Given this dilemma, the United Nations often now includes “expansion of state authority” in mission mandates, which was seen in the missions in the DRC, Mali, and Somalia. This “expansion of state authority” mission also cuts directly against the tenant of impartiality, because if you’re entering the hot zone with the task of expanding the authority of the state, you’re inherently going to be working against the non-state actors involved in the conflict. The expansion of UN Peacekeeping in response to non-state actors presents several quandaries, but there is one obstruction that may prove to be a deadly complication to UN Peacekeepers and their missions in the future: the lack of willingness of the United Nations to become a stronger player in the intelligence arena. The United Nations does not have any type of fundamental intelligence agency and Peacekeepers have traditionally been forced to rely upon “direct observation while on patrol, at checkpoints or observation posts” in furtherance of their mandates. In recent years and in response to dangerous peacekeeping operations such as “uncovering and intercepting large arms shipments, overseeing fragile regional cease-fires, monitoring controversial elections, supervising law enforcement agencies, disarming unwilling factions, mediating between hostile belligerents, providing humanitarian assistance, protecting civilian populations at risk, and engaging in armed combat”, the United Nations has permitted a small expansion of intelligence gathering to include new types of intelligence such as imagery intelligence (IMINT) and signals intelligence (SIGINT). In sum, the more covert the intelligence practice, the less likely the practice will be authorized by the proper UN authorities. This prohibition on covert intelligence collection activities poses an astronomical problem for Peacekeepers when they are sent on offensive peacekeeping missions in which they face violence from non-state actors and insurgents. The U.S. Army/Marine Corps Counterinsurgency Field Manual defines insurgency as “an organized movement aimed at the overthrow of a constituted government through the use of subversion and armed conflict”. “Clever insurgents strive to disguise their intentions”, and “[i]nsurgents succeed by sowing chaos and disorder anywhere”. Given the subversive and guerilla strategy of insurgents, maintaining security in these unstable environments requires incredible resources, including that of intelligence collection in order to successfully counter the insurgents’ operations. Unfortunately for the safety of UN Peacekeepers, there are a number of rationales as to why the UN prohibits intelligence collection activities. Historically, the UN “shunned all types of intrusive gathering of information because it felt it could not afford to lose credibility or tarnish its image as an impartial mediator by opening itself to accusations of employing covert or misleading techniques to gather information”. In 1960, Secretary-General Dag Hammarskjold even went so far as saying that the establishment of a UN intelligence agency would violate the idea of the organization having “clean hands”. That would assumingly mean that the Secretary-General was concerned that the agency would stoop to the level of underworld espionage that they were attempting to combat. More recently, former military advisor Frank van Kappen to the U.N. Secretary General has stated that “[t]he traditional attitude within the UN system is that intelligence gathering is contrary to the open nature of the UN system and is therefore absolutely forbidden”. Another aspect of the historical lack of willingness of the UN to become a strong player in the intelligence collection sphere is because of the perceived conflict between covert intelligence and the doctrine of impartiality, one of the three historical principles underpinning the UN Peacekeeping policy. “…Any covert intelligence is liable to create prejudice and suspicion… Trust, confidence and respect from the essential fabric on which a successful peacekeeping operation needs to be based. Spying does not help towards this end.” However, in light of the use of force to eliminate malignant non-state actors such as ISIS, this criticism is not applicable. If the mission of the UN Peacekeeping forces is to maintain international peace and security and remove threats to that peace under the mission of “expanding state authority” as seen in the DRC case, then such prejudice and suspicion of actors such as ISIS is a necessary element of the mission. This analysis is one of the central reasons why the UN has been slowly moving away from the impartiality doctrine in the first place. Moreover, some argue that the expansion of Peacekeeper intelligence capabilities would put novel pressure on the host states that may lead to them being unwilling to aid in the intelligence collection efforts. A key aspect of counterinsurgency strategy at the host state government level is to work closely with the host nation, gain their trust, and understand the level of infiltration by insurgents. Host-nation integration does not end there – it is also imperative that the counterinsurgent forces gain the trust of the local populace in order to gather information on insurgent activity. These tactics put a large strain on the host state: in the context of UN Peacekeeping offensive operations against non-state actors, the host state government and society must be completely willing to open their arms to the Peacekeepers in order to properly fuel the counterinsurgency efforts. This proves problematic when thinking about this issue from the perspective of the host state. Why would any state choose to side with the UN Peacekeepers, a force made up of unknown and relatively unskilled soldiers known for committing human rights abuses, over the local insurgents who continue to bomb them until they gain their political motives? It’s a counterintuitive notion, and one that cuts against the idea of Peacekeepers being in these situations at all unless they’re highly trained and equipped to do so. As expected when combating insurgents, the MINUSMA peacekeeping forces have suffered a number of fatalities, with improvised explosive devices (IEDs) proving to be the biggest threat. As of November 22, 2015, 56 peacekeepers have been killed in Mali and at least 109 more have sustained serious injuries. A ceasefire being reached between the government and the alliance of six armed rebel and Islamist groups in February of 2015; however, the ceasefire has not led to the end of insurgent attacks against UN peacekeeping forces. In June of 2015, the Security Council issued another resolution on the Mali crisis, this time “Strongly condemning the violations of the ceasefire by the Malian parties that occurred in Mali, which led to loss of life, including of civilians, and displacement and undermined the peace process,” and “Strongly condemning the activities in Mali and in the Sahel region of terrorist organizations, including Al-Qaida in the Islamic Maghreb (AQIM), Ansar Eddine, the covement for Unity and Jihad in West Africa (MUJAO), which continue to operate in Mali and constitute a threat to peace and security in the region and beyond, and human rights abuses and violence against civilians, notably women and children, committed in the North of Mali and in the region by terrorist groups”. Not surprisingly, these non-state actors have declined to adhere to any type of formal ceasefire and have continued malicious operations and attacks against Peacekeeping forces. There are several key takeaways to consider from the Mali case study:  the lack of willingness of individual states to continue to take on the responsibility of peacekeeping operations in remote nations, such as France in this scenario,  the lack of ability of “weaker” regional coalitions, such as those stemming between African nations, to effectively counter insurgent threats on their own,  the reinforcement of the utter lack of political legitimacy of non-state actors such as those engaging in terrorist actions in Mali, and  the grave threat to the safety of UN peacekeepers in the face of insurgent actors without adequate intelligent capabilities to counter the threat. The argument that the UN should authorize regional organizations or individual states to conduct peacekeeping operations rather than sending in the blue hats is ideal, but the Mali situation shows its unfeasibility. After two months of battling insurgents in Mali, France asked the Security Council to send in official peacekeeping forces. It is reasonable to assume that in this situation, France did not find it worth it to risk the lives of French troops in order to combat rebels in an African country like Mali, despite the strong historical connections between the two countries. As soon as French troops start to die in Mali, political pressures back home to pull the forces out are surely going to surmount. There is a political balancing test that takes place here: at what point is it actually worth it for the individual country, e.g. France, to risk the lives of its troops in order to calm a situation in a remote nation like Mali? This leads into a second problem: if a powerful and organized nation like France is not willing to invest in the long haul in combating insurgent forces in Mali, is the regional organization in question adequately equipped to do so? The answer may be a resounding “yes” if the conflict was taking place in Europe, for example, and the regional organization was one akin to NATO, but more poorly equipped forces such as those comprised of African nations may not be suited to handle these insurgent threats on their own. Given the lack of willingness of influential individual states to engage these non-state actors in countries such as Mali and the lack of ability of regional organizations to adequately counter these insurgent forces, the intuitive result is that the United Nations Security Council must send in a peacekeeping force in order to quell the attacks. However, if they are to do so, then these peacekeeping forces must be adequately equipped, trained, and able to handle such threats, or else they become nothing more than sitting ducks for insurgent forces to target with IEDs and other covert means. This means providing them with proper intelligence capabilities and allowing them to engage in covert operations in order to act as counterinsurgent forces. One of the principle means of counterinsurgency is protecting and gaining the support of the local populace in order to gain information on the guerilla forces and providing them with the inherent sense of security that will prompt them to ally with UN Peacekeeping forces and the state authority that the peacekeepers are there to help to strengthen. This shows a strong synthesis between the stated mission mandates of UN Peacekeepers, such as the ones seen in the Mali case, and the goals of counterinsurgency in general: to protect the local populace. The recent recommendation of the Panel of Peace Operations in June 2015 has opened the door to an increased use of intelligence collection. As the Panel stated, “United Nations personnel cannot stand by as civilians are threatened or killed. They must use every tool available to them to protect civilians under imminent threat. . .” and “Member States should provide the necessary resources and lend their influence and leverage to respond to threats against civilians.” Following the tragic attacks in Paris (of which ISIS claimed responsibility for) on November 14, 2015, editor-at-large Steven Clemons for the Atlantic reported that some of his French contacts have opined that “ISIS has been incubated for two years with an absence of US leadership, and that the United States needs to take the security of its allies more seriously, and it was a direct implication that we had not done and acted in a way to take action”. The United States has long committed itself to being a stalwart defender of its people in the realm of national security, but given the nature of the current threat, the distinction between international security and national security becomes less and less clear. However, this is not to say that the United States should or will start to provide massive amounts of military intelligence directly to the United Nations. Clearly the U.S. has a security interest in collecting as much intel as possible and storing it for personal strategic use. This sheds light on one of the major issues with the UN – it purports to be a unilateral system in the wake of peacekeeping issues, but its multilateral nature prevents nations from always sharing the findings of their intelligence agencies in order to further the peacekeeping missions. This practice should not be condemned – it is in the best interest of any individual state to keep their cards close to hand when it comes to the collections of their national intelligence agencies. Thus, the UN needs to look at how to either expand its intelligence collection capabilities within the framing of UN Peacekeeping missions or completely refrain from sending Peacekeepers into these nonsensical positions in the first place. Unfortunately, expanding intelligence collection capabilities poses a massive political problem. The United Nations is made up of a number of world actors with varying interests, and the humanitarian factions of these actors reportedly have absolutely no intention whatsoever to cooperate in the creation of an intelligence “agency”. This would seem to come from the “clean hands” criticism discussed earlier in this paper: these critics would argue that the UN is supposed to further humanitarian goals, such as peacekeeping, in as clean of a manner as possible, which means not engaging in operations that could be deemed as being surreptitious and delegitimizing the idealistic nature of the organization. This criticism is negligent if the Security Council continues to expose Peacekeepers to these volatile situations. The purpose of the UN Peacekeepers is to maintain international peace and security and protect civilians, protect and promote human rights, and provide support for humanitarian assistance and national and international justice. These principles have been stated time and time again, and one glance at any of the Security Council mandates on peacekeeping operations affirms these principles as the purpose of the mission. And, as argued above, these peacekeeping operations necessitate the use of proper intelligence in carrying out the mission mandate. Quality intelligence is a mandatory element of effective counterinsurgency practices. If a critic is “humanitarian minded” – i.e. claiming to be concerned with promoting human welfare – then it must logically follow that they should advocate for heightened intelligence collection capabilities of UN Peacekeeping forces in order to protect the human welfare of those communities that they are sent in to protect. Otherwise, everyone loses – the local communities continue to be victimized by insurgent forces, the UN Peacekeepers continue to be killed by IEDs, and the UN system as a whole fails in in its goal “to maintain international peace and security, and to that end: to take effective collective measures and removal of threats to the peace”. We must either (1) commence the use of heightened intelligence collection capabilities for Peacekeepers in order to uphold the purpose of the UN as elaborated in the Charter, or (2) accept the reality that Peacekeepers are not suited for these missions and should not be negligently placed in harm’s way. That being said, I do not claim that the expansion of intelligence collection capabilities of UN Peacekeepers will solve every problem that the force faces today. There are number of issues with UN Peacekeepers beyond the lack of intelligence collection capabilities. Have they been adequately trained? Are they properly financed? Most importantly, how do we prevent them from committing egregious human rights violations in the areas in which they have been deployed, directly counteracting the counterinsurgency principle that the trust of the local populace must be gained in order to collect proper intelligence on the opposing guerilla forces? These are all problems that the international community must face moving forwards, especially in light of the expanding threats from illegitimate non-state actors such as the Islamic State of Iraq and Syria. These actors are not only engaging in attacks in the Middle East and Africa, but have also engaged in attacks against UNSC permanent members, including the recent abhorrent attacks against France and threatening that “blood will spill like an ocean” in Russia. If there was ever a moment ripe for the strengthening of UN Peacekeeping forces and the expansion of their intelligence collection capabilities, now would be the time. However, this expansion must be done with the utmost level of care and nuance in both its proper training of peacekeepers and the way it engages in intelligence collection activities, or else they Security Council may be sending out the peacekeepers to once again act as blue-hatted sitting ducks. United Nations, What is Peacekeeping?, available at http://www.un.org/en/peacekeeping/operations/peacekeeping.shtml. U.N. Charter art. 1, para. 1. Report of the Panel on United Nations Peace Operations, U.N. GAOR, 55th Sess., P 84, U.N. Doc. A/55/305 (2000) (“Such forces should be afforded the field intelligence and other capabilities needed to mount a defence against violent challengers”). See Mateja Peter, Between Doctrine and Practice: The UN Peacekeeping Dilemma, Global Governance 21 (2015), 351, 356. UN Dep’t of Peacekeeping Operations, United Nations Peacekeeping Operations: Principles and Guidelines (2008) [hereinafter Capstone Doctrine]. Peter, supra note 9, at 356. 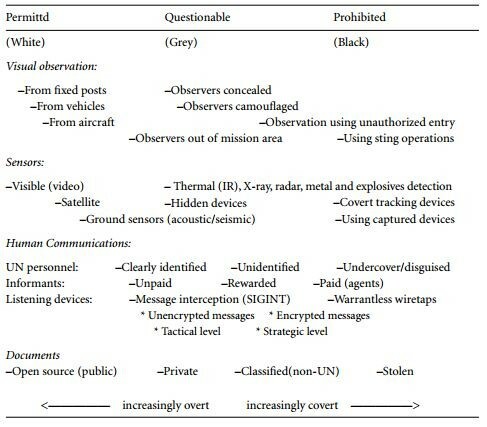 A. Walter Dorn, United Nations Peacekeeping Intelligence, THE OXFORD HANDBOOK OF NATIONAL SECURITY INTELLIGENCE 275, (Loch K. Johnson ed., 2010), available at http://walterdorn.net/79-united-nations-peacekeeping-intelligence. The U.S. Army/Marine Corps Counterinsurgency Field Manual, supra note 4 at 1-1. Frank van Kappen, Strategic Intelligence and the United Nations, in Peacekeeping Intelligence: Emerging Concepts for the Future 3, (Wies Platje et al. eds., 2003). Ashley Leonczyk, supra note 12 at 97 (2010) (emphasis added). Gustavo Diaz, Intelligence at the United Nations for Peace Operations, Unisci discussion papers, available at https://www.ucm.es/data/cont/media/www/pag-72528/Gustavo13a.pdf (internal citations omitted). The U.S. Army/Marine Corps Counterinsurgency Field Manual, supra note 3-34. France Wants U.N. To Take Over Peacekeeping Mission In Mali, npr.org, http://www.npr.org/2013/03/20/174867729/france-wants-u-n-to-take-over-peacekeeping-mission-in-mali (last visited November 22, 2015). S.C. Res. 2100, U.N. Doc. S/RES/2100 (Apr. 25, 2013). Analysis: UN peacekeepers struggle against IEDs in Mali, available at http://www.janes.com/article/47610/analysis-un-peacekeepers-struggle-against-ieds-in-mali (last accessed November 22, 2015). http://www.un.org/en/peacekeeping/missions/minusma/facts.shtml (reporting 56 fatalities); http://www.un.org/apps/news/story.asp?NewsID=49763#.VlHMG3arSUk (reporting 109 injuries). Mali signs UN ceasefire to end conflict with northern rebels, CNN.com, http://www.bbc.com/news/world-africa-31544438 (last visited November 22, 2015). Six U.N. peacekeepers killed when convoy attacked in Mali, nbcnews.com, http://www.nbcnews.com/id/57575217/ns/world_news-europe/t/six-un-peacekeepers-killed-when-convoy-attacked-mali/ (last visited November 22, 2015). S.C. Res. 2227, U.N. Doc. S/RES/2227 (June 29, 2015). Leoncyk, supra note 12 at 173-174. U.N.S.C. Rep. of the Security Council, June 17, 2015, U.N. Doc. A/70/95. Why has France become a regular target?, MSNBC.com, http://www.msnbc.com/msnbc-news/watch/why-has-france-become-a-regular-target–566883907527 (last visited November 15, 2015). See Diaz, supra note 27 at 33. See S.C. Res. 2100, U.N. Doc. S/RES/2100 (Apr. 25, 2013). See, e.g., Richard J. Wilson & Emily Singer Hurtvitz, Human Rights Violations by Peacekeeping Forces in Somalia, available at https://www.wcl.american.edu/hrbrief/21/2wilson.pdf. ISIS threatens Russia in new video, CNN.com, http://www.cnn.com/2015/11/12/middleeast/isis-russia-threat/ (last visited November 15, 2015).